, which produced a baseball team out of thin air, in La La Land even if you're lucky enough to build it, there's no absolute guarantee that viewers will come. Yet, instead of simply playing ball with a ghost in Dreams, Hollywood's rule of thumb is that if you've built it and cash paying fans have lined up, then your creative reward is to go right back to the drawing board and churn out at least one extremely similar sequel. And following the success of the fan-favorite uncensored, extended Family Guy straight to disc episode Stewie Griffin: The Untold Story, the pressure was placed on Guy's brainchild Seth MacFarlane to duplicate the event for his series that he jokingly acknowledged in Something has been nearly canceled twice. Refreshingly, he avoided the temptation for more Stewie Griffin like Untold sagas about the remaining members of America's favorite animated family since Matt Groening's The Simpsons. 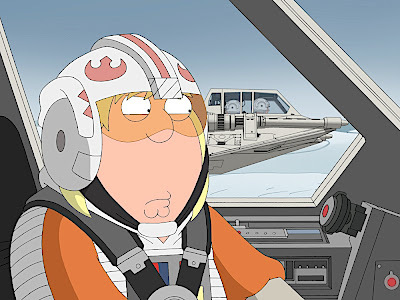 And with his effort, MacFarlane struck an enviable balance of rewarding his fans for their loyalty by delivering an idea that would not only guarantee a Family Guy trilogy for Fox but also hearken directly back to the series by developing Guy's trademark pop culture spoofs into a sustained riff. Extremely ambitious in his choice of material, MacFarlane decided to remake a fellow Fox franchise when George Lucas became an extended member of his Family in 2008. Although Lucas is no stranger to spoofs since two decades earlier, Mel Brooks used his movies and other science fiction classics for Fox's Spaceballs, an animated take on George Lucas' beloved classics was risky for fans of both franchises. 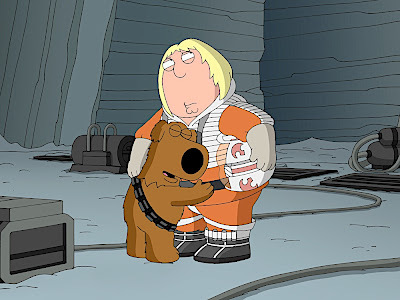 Using Star Wars as his muse, the original 1977 work was lampooned in Family Guy's Stewie Griffin follow-up Blue Harvest. Both the original and its recent 2009 adaptation of Empire Strikes Back are framed during a power outage that temporarily leaves the family without television. To remedy their boredom, as seen in Something, Something, Something Dark Side (which actually takes its title from an old episode joke), the dimwitted patriarch Peter continues telling the rest of the Griffins the story of the Star Wars movies. After a hilarious crawl and the exact John Williams score that still sends shivers down your spine (especially in HD surround) that finds the writers ridiculing Fox's bad decisions and lack of faith in both George Lucas and MacFarlane's Family Guy respectively, we head giggle-first into a high-def full-frame galaxy far, far away. 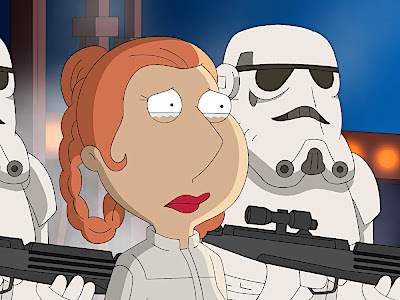 Although it's been a long while since I've seen the original works as I grew up with an older brother who played the films repeatedly during our childhood, I was admittedly in awe at just how faithful MacFarlane and company were to Empire, even down to the love/hate screwball comedy dynamic of Leia (Lois) and Han Solo (Peter). Whether we're told to “punch it, Chewie,” long after the Griffins survive “the giant robot camels” as they later reason that since four of the five major cast members are in a scene, they'll obviously survive, it's a Something, Something, Something blast. Likewise, the roughly hour long episode is additionally filled with additional spoofs of other genre blockbusters including Back to the Future. 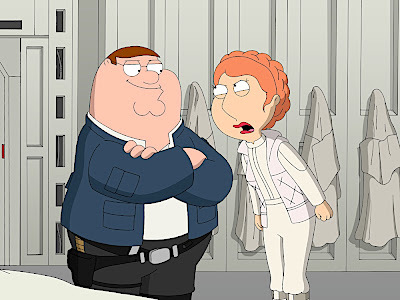 Needless to say, if you're familiar with the show, you'll enjoy the Family Guy brand of random off-the-wall humor as Stewie's Darth Vader laments not having the budget for business cards and tries convincing his maid that generic Windex does the job just as well as the expensive kind. Staying true to the nature of the program that holds nothing-- with the exception of The Force-- sacred, the uncensored Something, Something, Something is filled with off-color humor and some ingeniously used f-bombs including one leveled at poor Raggedy Andy when Stewie's Darth Vader kicks him out of his Bounty Hunter Meeting. To this end, as with all discs, you'll want to be sure to preview the movie before assuming that all animation is automatically safe for children. In deciding upon a format, it's honestly up to your individual taste and budget as Fox's Blu-rays are consistently excellent and the animation and sound are both sharply defined in full HD 1080 pixels. 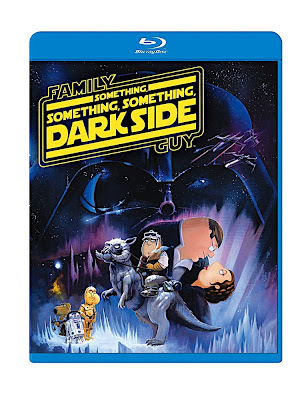 However, being that a bulk of the extras consist of table readings along with the fact that the full frame presentation is a bit of a disappointment to those hoping for a cinematic widescreen cinematic approach, initially the price of the Family Guy Blu-ray doesn't seem worthwhile since we're fed one episode instead of an entire season. Thankfully to justify the price difference of DVD and Blu-ray especially considering that they contain all of the same extra features, Fox has included a major bonus for the Blu-ray purchase by giving consumers the same movie twice in two different formats for the same amount as the Blu-ray contains a digital copy of the film that's compatible for PCs, Macs, and portable devices. 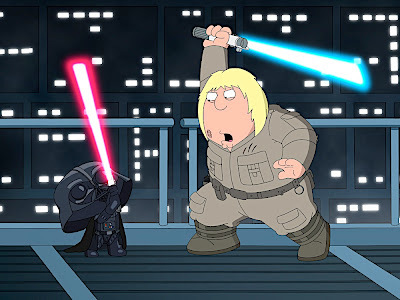 Complete with some unexpected live action footage inserted into the animation as Something segues spontaneously into clips from Rocky IV and Her Alibi, this Empire send-up also contains insider jokes regarding Seth Green's less-than-stellar Without a Paddle along with his well-received Star Wars spoofs on Cartoon Network's Robot Chicken. While the humor is classically Family Guy, the technical side of the animation is ratcheted up to a more impressive Lucas-worthy degree. 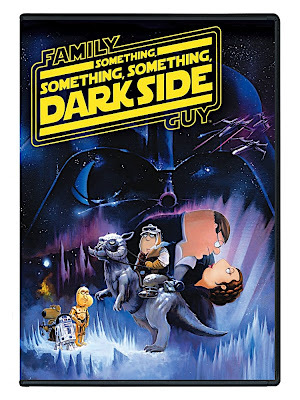 Overall, this certain Something is sure to make you look forward to the final installment We Have a Bad Feeling About This as the forces of MacFarlane and Lucas are scheduled to align once more to bring us the hilariously entertaining "Dark Side of Blu-ray." FTC Disclosure: Per standard professional practice, I received a review copy of this title in order to evaluate it for my readers, which had no impact whatsoever on whether or not it received a favorable or unfavorable critique. All questions can be directed either to myself or Stewie Griffin; Windex not included.